Silverlight 2 supports communication with a WCF service in simple text (the basicHttpBinding), so anyone can use a packet sniffer (e.g. Fiddler) to read our data. Anyone can access our WCF service, call its methods and get our data. Anyone can download our Silverlight application (the .xap file), open it (since it is simple a zip file), extract the DLLs and use Reflector to read all our code. The first problem can be solved by securing the transmission via transport security (using https protocol). More on this can be found at MSDN here. In this post, I will try to address the last two issues. This way, if anyone tries to access the WCF service, or download the Silverlight .xap file, or view a page inside the ASP.NET website, the ASP.NET engine authenticates the request and only authorized users are able to view the application or use the service. So now, if our application is configured to use Windows authentication, the ASP.NET engine authenticates the request via integrated windows authentication. If it succeeds, users are automatically redirected to the Silverlight application; otherwise they get a HTTP 401.1 – Unauthorized message. And, if our application is configured to use Forms authentication, the ASP.NET engine takes the user to an aspx login page. Once the user is validated (we can use either ASP.NET built-in authentication or any custom implementation to authenticate the user), he/she is redirected to the Silverlight application. To observe this, you can download this application (Be sure to first rename the file to zip; this is a WordPress requirement) and toggle its authentication technique between Windows and Forms using web.config. Note that the application also demonstrates how to get the logged in user in Silverlight using a WCF service call. The key is that we can use System.Web.HttpContext.Current.User to get the current user principal if the WCF service is running in ASP.NET compatibility mode. At this point, we have made sure that our application and WCF service is only accessible to authorized users. But the problem still exists to a small extent, although narrowed down to authorized users instead of general public. To further secure our application, we need to use some .NET obfuscater. 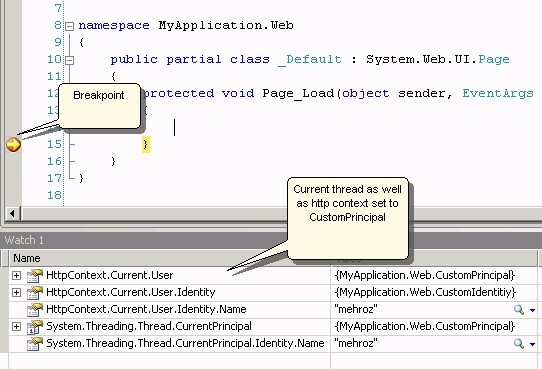 This will ensure that no one, including authorized users, will be able to decompile our code using .NET reflector. And, to further enhance our WCF service security, we need to implement declarative or imperative security checks for our service methods. As with typical ASP.NET applications, we may need a custom implementation of IPrincipal and IIdentity for securing the WCF service using declarive security attributes. That’s all. Let me know what you do think in the comments section below. FormsAuthentication is the most generic authentication for securing ASP.NET applications. By default, it assigns a GenericPrincipal to HttpContext.Current.User (as well as Thread.CurrentPrincipal) with a FormsIdentity object. If we need to use a custom implementation of IIdentity and IPrincipal with forms authentication, we simply need to hook the AuthenticateRequest event in global.asax.cs and assign our CustomPrincipal to HttpContext.Current.User.